Dexter Daily: Who Said That? : "If I Could Go Back and Redo a Season, I Want to Redo the First"
Who Said That? 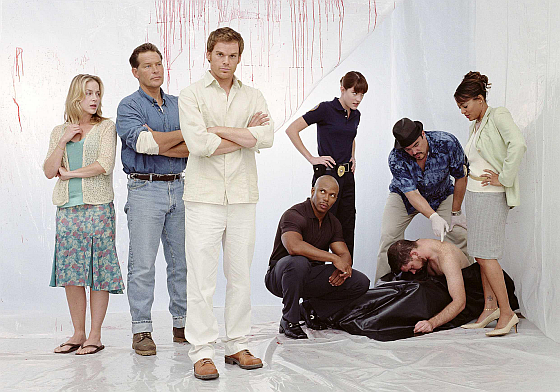 : "If I Could Go Back and Redo a Season, I Want to Redo the First"
"I apologize to my friends for the first season of Dexter, because I feel like I was green and uncomfortable. If I could go back and redo a season, I wanna redo the first." Who do you think said this? Tell us in the comment section, below! UPDATE 3/23: VIDEO: Jennifer Carpenter Talks Dexter: "If I Could Go Back and Redo a Season, I Want to Redo the First"
Jennifer Carpenter playing her Debra role? Would have to be Jennifer Carpenter, as she's the cast member who really changed the most over time in her performance. She was kind of amusing in season one, but by later seasons she was spectacular. My money is on Jennifer but it wouldn't surprise me if it was Julie Benz. If it was Julie Benz, she was wrong. Her first season performance was amazing. She WAS Rita, she acted just like a woman who had been abused and had post traumatic stress. After season 1 she was all bitchy and blah blah blah which was totally unrealistic considering her background. She never felt like Rita again, but just a run of the mill suburban housewife who never actually had been a victim of abuse or anything. That whole bit where she went on a tirade about Paul's death and leaned on Dexter about it was the most irritating. I mean good grief, remember when she was crying and practically begging Dexter to do something?